Vanhelgd is perhaps the most shining of all the hidden gems of the contemporary death metal scene. Since their 2008 debut the Mjölby outfit has improved with each album and started to gain some well-deserved recognition. Their last album 'Relics of Sulphur Salvation' was an excellent effort and expectations run high for its follow-up 'Temple of Phobos'. So does it surpass its predecessor? The short answer is no, but it is definitely on par. There is little doubt Vanhelgd has its roots in the classic Swedish death metal sound. The guitar work has the feeling of Nihilist and Grave all over it, but with each album the band has taken their sound in a more doom-influenced direction. This trend continues on 'Temple of Phobos' and genre wise the band now finds itself somewhere right between doom and death metal not far from early Asphyx. Apart from the second part of the closer 'Allt Hopp Är Förbi' the music churns on it doom- or mid-tempo with only small bursts of increased speed. It is as heavy and crushing as it comes with an intense feeling of despair surrounding the listener. On paper the individual musical aspects are by the book doom/death metal, but the typical Vanhelgd riffing style and guitar hooks covers the entire audial onslaught in a dense atmosphere. Despite using small means this album brings forth hopelessness and anguish that rivals most depressive black metal bands. The guitar work is simultaneously catchy making this all the more impressive. The vocals brings David Vincent's early Morbid Angel efforts to mind and serves the purpose of amplifying said atmosphere while also giving the album a good dose of aggression. 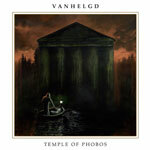 With 'Temple of Phobos' Vanhelgd continues to evolve towards more doom-oriented territories without losing a shred of the aggression or memorable riff work from its predecessors. Thanks to the bands exceptional song writing skills this is one of the most intense display of despair in years, despite its minimalistic approach. This is a mandatory buy for any fans of either doom or death metal and a good start for working one's way back through the discography.